Close to the freeway and major corporations and offering a complimentary airport shuttle an Olympic-size pool and on-site dining the non-smoking Sheraton San Jose Hotel entices our guests. The nine-floor Sheraton's well-appointed lobby comes complete with a business center a 24-hour convenience store and a restaurant offering casual American cuisine. Guests can relax in the lushly landscaped courtyard boasting tropical plantings and a heated Olympic-size pool. There's also a 24-hour fitness center. All 229 rooms are decorated with contemporary furniture in rich colorful tones and have flat-panel TVs with premium channels pillowtop mattresses high-thread-count linens work desks and free weekday newspapers. Room service is available. Pets are welcome for an extra fee. Club Level rooms have private balconies and other upgraded amenities. The hotel provides a free airport shuttle (with limited hours) and complimentary parking. 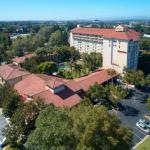 Located right off I-880 the Sheraton is two miles from Cisco Systems and the Great Mall of the Bay Area. Both Mission College and California's Great America theme park are about five miles from the hotel. If you have a flight to catch San Jose International Airport is three miles away.